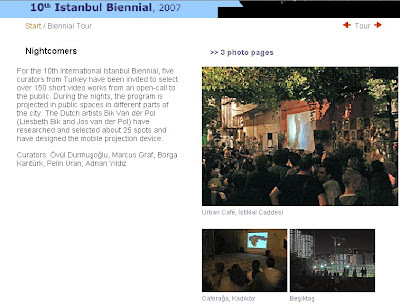 “For the 10th International İstanbul Biennial, five curators from Turkey have been invited to select over 150 short video works from an open-call to the public. During the nights, the program, under the title of “Nightcomers / Gecegezenler”, will be projected in public spaces in different parts of the city, from the centre to the periphery. The Dutch artists couple Bik Van der Pol have researched and selected about 25 spots and have designed the mobile projection device. Hakan Akçura’s two art videos, “Mr. President Let Me Challenge You to Face Him (1-2)” in the “Nightcomers / Gecegezenler”. Mr. President let me challenge you to face his 1-2 from hakan akcura on Vimeo.